Do you know an exemplary real estate developer or investor who is creating great walkable places, and has displayed exemplary public leadership to advance smart growth development? If so, nominate them for the 2018 LOCUS Leadership Award. All-inclusive benefits of a complimentary one year LOCUS Steering Committee membership. Spotlight profile feature in LOCUS’ monthly newsletter distributed to nationwide network and posted on our website. A complimentary trip to Washington, D.C. to accept the National Leadership award and make a brief presentation about their award-winning project. The deadline to submit nominations has been extended to Friday February 23, 2018. Award winners will be announced on March 5, 2018. Full eligibility and criteria are available on our website. 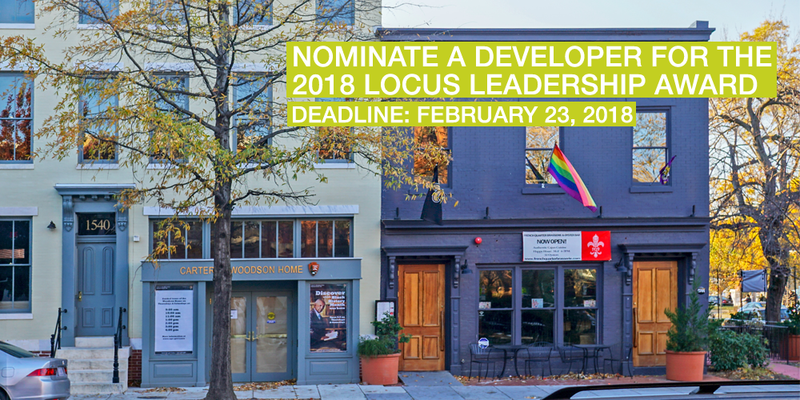 LOCUS’ 2018 National Leadership Awards will be presented at the 2018 LOCUS National Leadership Summit: Rebuild America’s Neighborhoods, taking place on April 22-24, 2018 in Washington, D.C.
Come and celebrate the winner of this year’s award with us!